Sassi’s Wood Grilled Octopus- A highlight of our recent dining experience at Sassi, the Wood Grilled Octopus absolutely to die for! 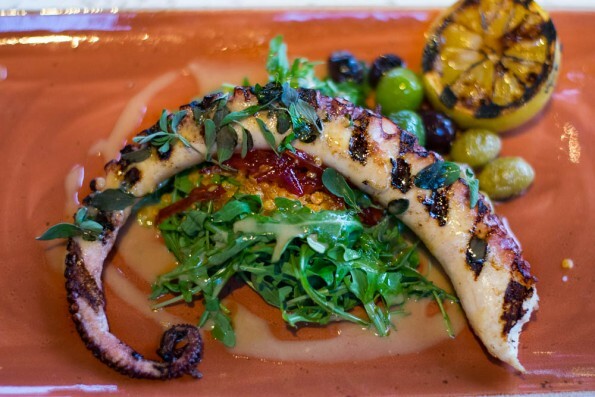 Served over an arugula salad topped with crispy lentils and candied chilies, the octopus is one of our favorite appetizers in the valley. Perfectly cooked and delicious, it does not disappoint. Central Bistro’s Burrata- Central Bistro‘s Burrata was brought the creamy cheese to our radar. Comprised of Burratta, Salsa Verde, Marinated Fennel, and Herb Salad, this appetizer made us realize how much we actually like it. 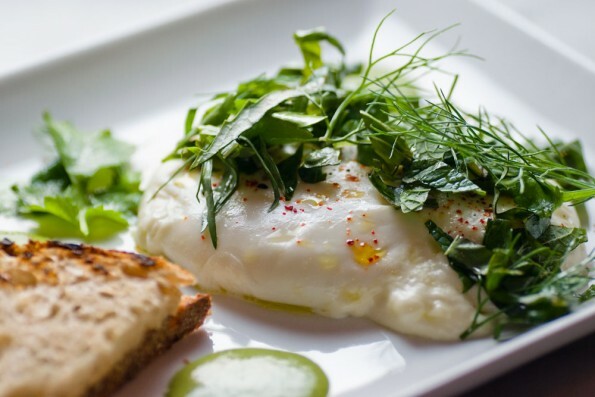 The addition of the salsa verde and marinated fennel makes Central Bistro’s Burrata a must try! Simon’s Hot Dogs’ Tokyo Madness- Hot Dogs are not typically something that we go out for a lot because honestly, it’s one of those things we’d rather cook ourselves. Simon’s Hot Dogs changed that for us. 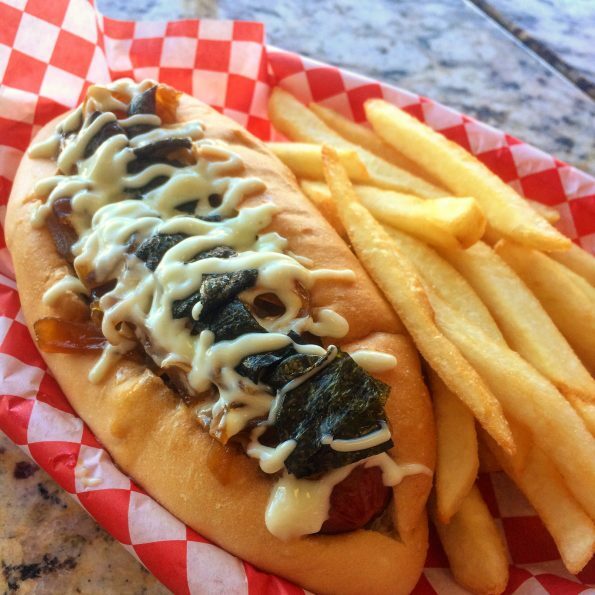 Their Colombian style hot dogs are available for both meat eaters and vegans alike. We tried both the Colombian and Tokyo Madness. Both were delightful, but the Tokyo Madness (Teriyaki onions, Wasabi Mayo and Toasted Sushi Nori) was the favorite. The flavors were HUGE! The wasabi mayo and sushi nori were reminiscent of hot dog version of Spam Musubi. It may not be a traditional hot dog but it is a fantastic way to start a new tradition. Oasis Bakery and Cuisine’s Zerban with Goat- At the recommendation of Dominic Armato we decided to try the Yemeni restaurant Oasis Bakery and Cuisine. 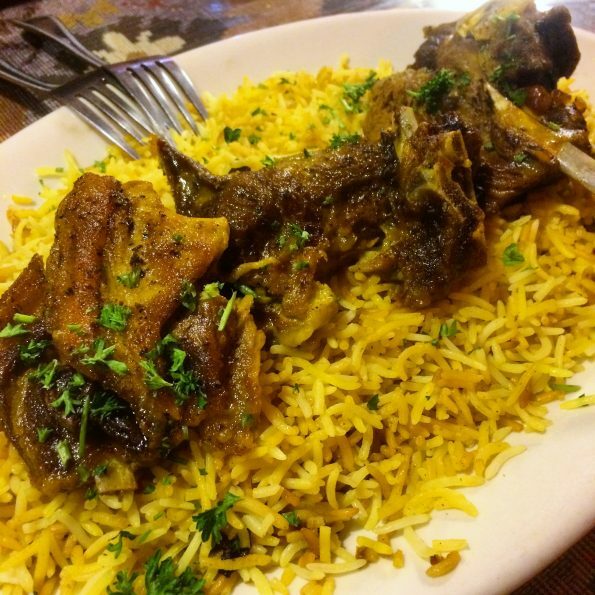 One of our favorite things about Middle Eastern cuisine is getting the chance to eat goat. Goat is basically lamb’s more awesome brother. Goat is offered on so few menus that when we see it, we have to try it (Dominic, we’ll order the fish next time). Oasis’ Zerban is served with an amazing saffron rice and tender goat (or meat of your choice) that falls off the bone. If you are looking for something new and different to try, Oasis Bakery and Cuisine is the place for you! The Upton’s Fried Chicken- Fried chicken is commonly thought of as something that goes with waffles or that the Colonel serves. The Upton classes up the traditional breaded poultry by serving it with roasted shishito peppers and green onion mashed potatoes. Each order is huge and can easily be shared (if that’s your thing). 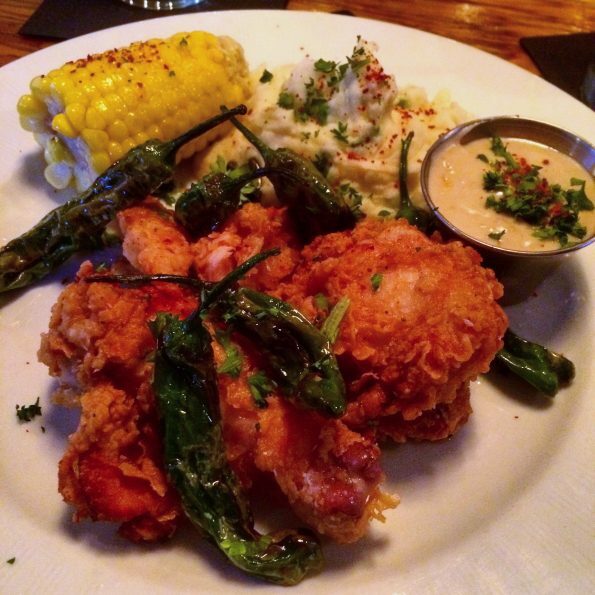 The breading (otherwise known as the most important part of fried chicken) is full of flavor and the chicken is juicy. We never think to order fried chicken at a restaurant but paired with a mint julep, the Upton has a Sunday supper tradition in the making. As we mentioned, this is only a small portion of the awesome food we have been lucky enough to try so far this year. We are always trying new things and plan to share more of them! Now its your turn, we’d love to hear from you! Tell us about the awesome foods you’ve tried and where you’ve eaten them! Comment below or tag us with the hash tag #GeekEats. *This article is comprised of both comped meals (Sassi and Central Bistro) and meals in which the Geeks were not comped; opinions are wholly our own. View our Disclosure Policy for more info. Next → Next post: 4 Recipes for a Stellar Star Wars Day!